Voltaire (pen name of François-Marie Arouet) (1694-1778) was a leading French philosopher in the Enlightenment, advocating freedom everywhere and emphasizing his form of reason. He was a deist who criticized contemporary Christianity and often religion in general. Voltaire is sometimes called the "Father of the Enlightenment." In Candide (1759), his chief work, Voltaire criticized a philosophical theory which was popular at the time, best expressed by Leibniz, that stated the world was in its best possible state because it was in God's hands. To illustrate this point, he follows the story of Candide as increasingly terrible things happen to him until he loses his optimistic view of the world and his faith. Voltaire was very critical of religion, and has been variously categorized as an atheist or an agnostic, though in reality he was a deist. A death-bed admonition to a priest attempting to convert him that "Now is no time to be making new enemies" has also been misconstrued as meaning he was a satanist, though evidence exists to show he was truly a deist. Although he was a deist, Voltaire actually described himself as a theist. In his Philosophical Dictionary, he fantasizes a conversation in which he asks a spirit, implied to be Jesus, "Tell me if there have been peoples other than the Christians and the Jews in whom zeal and religion wretchedly transformed into fanaticism, have inspired so many horrible cruelties." The spirit replies "Yes, the Mohammedans were sullied with the same inhumanities, but rarely; and when one asked amman, pity, of them, and offered them tribute, they pardoned. As for the other nations there has not been one right from the existence of the world which has ever made a purely religious war." Voltaire concludes by stating that he accepts Jesus as his only master, endorsing a simplified version of Christianity obeying the tenets of the Golden Rule but none of the dogma present in his era's churches. Voltaire also erected a Church in his hometown of Ferney (now Ferney-Voltaire) with the inscription "Deo erexit VOLTAIRE" ("Erected to God by VOLTAIRE"). He had, however, created a blueprint for the infiltration and destruction of Christianity from within, according to Timothy Dwight. "I TELL you again, ignorant imbeciles, whom other ignoramuses have made believe that the Mohammedan religion is voluptuous and sensual, there is not a word of truth in it; you have been deceived on this point as on so many others. Canons, monks, vicars even, if a law were imposed on you not to eat or drink from four in the morning till ten at night, during the month of July, when Lent came at this period; if you were forbidden to play at any game of chance under pain of damnation; if wine were forbidden you under the same pain; if you had to make a pilgrimage into the burning desert; if it were enjoined on you to give at least two and a half per cent. of your income to the poor; if, accustomed to enjoy possession of eighteen women, the number were cut down suddenly by fourteen; honestly, would you dare call that religion sensual? The Latin Christians have so many advantages over the Mussulmans, I do not say in the matter of war, but in the matter of doctrines; the Greek Christians have so beaten them latterly from 1769 to 1773, that it is not worth the trouble to indulge in unjust reproaches against Islam. Try to retake from the Mohammedans all that they usurped; but it is easier to calumniate them. I hate calumny so much that I do not want even to impute foolishness to the Turks, although I detest them as tyrants over women and enemies of the arts. I do not know why the historian of the Lower Empire maintains that Mohammed speaks in his Koran of his journey into the sky: Mohammed does not say a word about it; we have proved it. Bust of Voltaire with wig. However, he also believed democracy would only work in a small peaceful country. Voltaire believed that any excesses or wrongs wrought by democracies were inherently less evil or harmful than those than could be inflicted by tyrannies. "The great vice of democracy is certainly not tyranny and cruelty: there have been mountain-dwelling republicans, savage, ferocious; but it is not the republican spirit that made them so, it is nature. The real vice of a civilized republic is in the Turkish fable of the dragon with many heads and the dragon with many tails. The many heads hurt each other, and the many tails obey a single head which wants to devour everything." He also indicated some support for what he called "enlightened despots", which ultimately paved way to the "smarter than thou" attitude of various leftists. [Voltaire] was well known as an outspoken opponent of Christianity, and predicted that it would cease to exist within 100 years. However, when a stroke put him on his death bed, Voltaire's stony exterior began to crack and reveal his miserable, frightful condition. For two months he was tortured with such an agony that led him at times to gnash his teeth in impotent rage against God and man. He would turn his face and cry out, "I must die, abandoned of God and of man." His condition became so frightful that even his associates were afraid to approach his bedside. In fact, his own nurse is quoted as saying, "For all the wealth of Europe, I would never see another infidel die. It was a scene of horror that lies beyond all exaggeration." Voltaire's influence surpassed him in death: One of his sayings, "To Philosophy! ", was nailed onto one of the atheistic Temple of Reasons during the French Revolution. In addition, Charles de Gaulle, when pardoning left-wing activist and philosopher Jean-Paul Sartre during the May 1968 riots, cited Voltaire as his reason, saying "One does not arrest Voltaire." (which is false, as Voltaire had in fact been arrested and spent nearly a year at the Bastille, and in fact his pen-name "Voltaire" had originated from one of his prison sentences.) 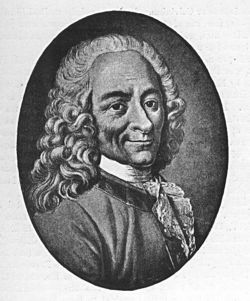 In addition, the website voltairenet.org was named after Voltaire. In addition, Voltaire, or, more specifically, his hostility to all revealed religion, acted as one of four sources for the American Library Association's radicalization. ↑ Dake, Finis Jennings. God’s Plan For Man. 1949, copyright renewed 1977. Dake Bible Sales, Lawrenceville, Georgia. pp. 731-734. "Where did the ALA's [American Library Association's] current, radically subjectivist/individualist philosophy come from? The ALA, which constantly quotes from the First Amendment and whose brochures picture the Founding Fathers, would have you believe that it springs from James Madison's Enlightenment ideas about freedom. Not so. The ALA's philosophy comes from four sources: first, the later Enlightenment philosopher, Voltaire, who was hostile to all revealed religion." This page was last modified on 3 April 2019, at 17:47.